Dear friends, today, we celebrate the memorial of the St. Lorenzo Ruiz, the 1st Filipino saint and one of the many patron saints of the Philippines and of the Filipino people. On this day, I greet all my fellow Filipinos, especially those who have left the country in order to provide a better future for their loved ones. St. Lorenzo Ruiz is an example of what a Filipino Catholic should be: faithful to his spouse, firm in his faith, and not afraid to give his life for love of God and of his faith. He had experienced separation from his loved ones when he had to escape from a false accusation of killing a Spaniard, seeking asylum on board a ship with 3 Dominican priests on their way to Japan. For this reason, to him we entrust all the Filipino families separated from their parent/s who are working overseas. He also faced a hostile and anti-Catholic environment but remained steadfast in his faith. My thoughts go to our fellowmen who work overseas in places where Catholicism is the minority so that through the intercession of St. Lorenzo Ruiz, they would remain faithful Catholics and not be swayed away by other denominations or religions. He also remained faithful not only to the Catholic faith, but to his marriage vows as well. For this reason, let us entrust to him the marital fidelity of all Filipinos to their spouses whom they have left behind in their homeland. Through the intercession of Our Mother Mary, Star of the Orient, and of St. Lorenzo Ruiz, let us entrust to God the Philippines and her people, especially those working overseas, so that our nation will resist all types of ideological colonization seeping into the country and remain as the bastion of the Catholic faith in Asia; and so that wherever we, Filipinos, may be, we may give witness to Our Lord Jesus Christ through our words, hard work, cheerfulness, good example, good conduct and fidelity to our Catholic faith: in short, through our daily struggle to live a holy life. -Fr. Rolly Arjonillo, priest of Opus Dei. CATHOLICS STRIVING FOR HOLINESS. We are also in Facebook:www.facebook.com/CatholicsstrivingforHoliness Hope you like our page and invite your friends as well to do so in order to help more people. Lorenzo Ruiz was born in Binondo, Manila to a Chinese father and a Filipino mother who were both Catholic. His father taught him Chinese while his mother taught him Tagalog. Ruiz served as an altar boy at the Binondo Church. After being educated by the Dominican friars for a few years, Ruiz earned the title of escribano (calligrapher) because of his skilful penmanship. He became a member of the Cofradia del Santísimo Rosario (Confraternity of the Most Holy Rosary). He married Rosario, a native, and they had two sons and a daughter.The Ruiz family lead a generally peaceful, religious and content life. In 1636, whilst working as a clerk for the Binondo Church, Ruiz was falsely accused of killing a Spaniard. Ruiz sought asylum on board a ship with three Dominican priests: Saint Antonio Gonzalez; Saint Guillermo Courtet; Saint Miguel de Aozaraza, a Japanese priest; Saint Vicente Shiwozuka de la Cruz; and a lay leper Saint Lázaro of Kyoto. Ruiz and his companions left for Okinawa on 10 June 1636, with the aid of the Dominican fathers and Fr Giovanni Yago. The Tokugawa shogunate was persecuting Christians by the time Ruiz had arrived in Japan. The missionaries were arrested and thrown into prison, and after two years, they were transferred to Nagasaki to face trial by torture. He and his companions faced different types of torture. On 27 September 1637, Ruiz and his companions were taken to the Nishizaka Hill, where they were tortured by being hung upside down a pit. This form of torture was known as tsurushi (釣殺し) in Japanese or horca y hoya (“gallows and pit”) in Spanish. The method was supposed to be extremely painful: though the victim was bound, one hand was always left free so that victims may signal their desire to recant, leading to their release. Ruiz refused to renounce Christianity and died from blood loss and suffocation. His body was cremated, with the ashes thrown into the sea. Main Article – Catholics Striving for Holiness. 2016. 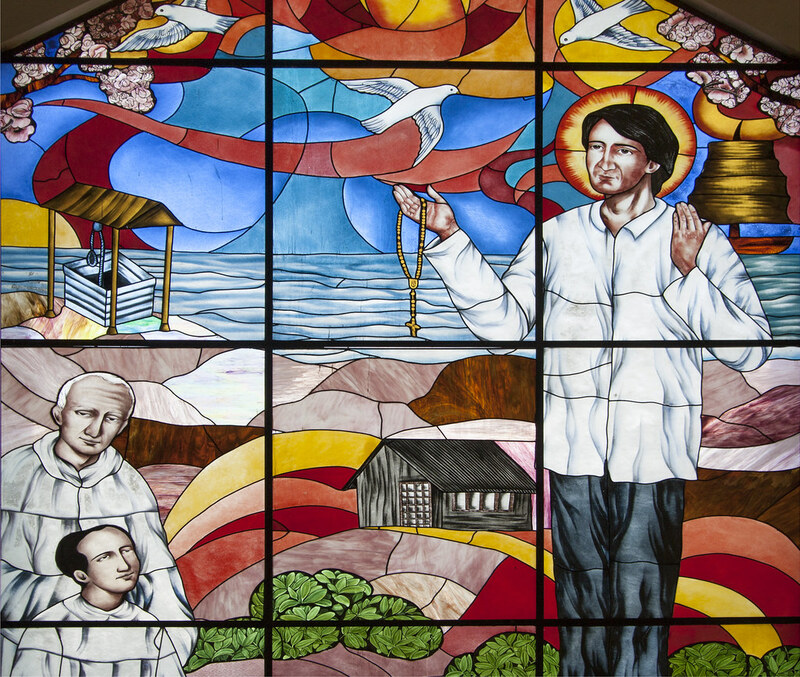 Sept. 28: St. LORENZO RUIZ & COMPANIONS, Martyrs. Patron saint of OFWs (Overseas Filipino Workers), of the Filipinos and of the Philippines | Catholics Striving for Holiness. [ONLINE] Available at: https://catholicsstrivingforholiness.com/2015/09/27/sept-28-st-lorenzo-ruiz-companions-martyrs-patron-saint-of-ofws-overseas-filipino-workers-of-the-filipinos-and-of-the-philippines/. [Accessed 22 September 2016]. Next postFixing our eyes on what is unseen….